After you digest all of the various options in the character creation section and dig into the ground combat, there's an entire other layer to Pillars of Eternity 2: Deadfire waiting for you. Naval exploration, combat, and crew management are huge additions to Deadfire, but some of the terminologies may be foreign to new and old players of Obsidian's RPG. 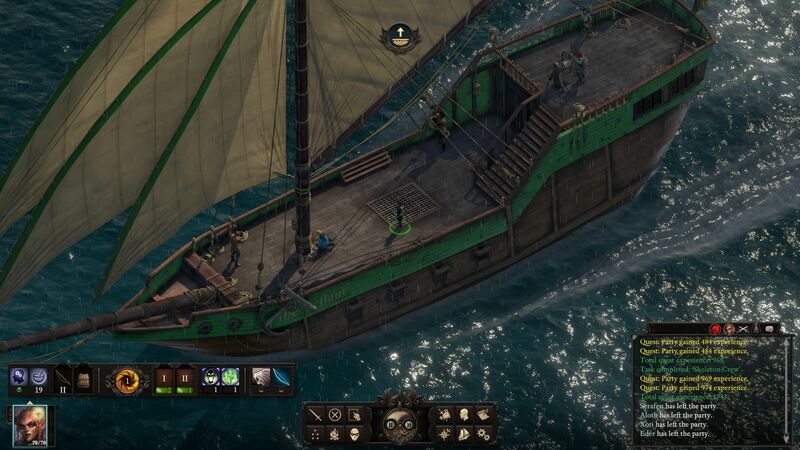 To get you prepared and out to sea, ready to plunder with the best of em, we've put together this guide explaining the important nautical terms as they relate to the Pillars of Eternity 2: Deadfire experience. 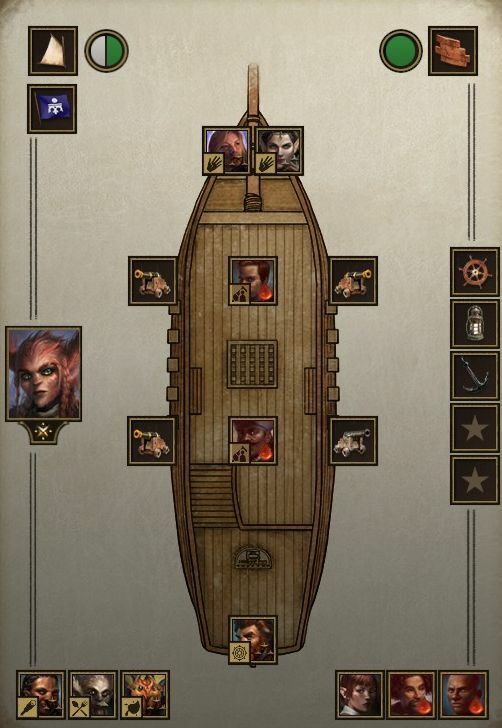 This is the body or shell that keeps the ship floating and, in Deadfire, it serves as the health bar while in combat. If it falls to zero, your ship will sink and it's game over. These are pieces of fabric attached to the ship, arranged in a way to catch the wind and propel the vessel. These items determine how swift your ship is in combat and in overworld travel. Damage to them will limit maneuverability. This identifies your ship's allegiance and you'll find a collection of them throughout your travel in Pillars of Eternity 2: Deadfire. This is the ship's steering mechanism, also known as the ship's wheel. These are the lights equipped to your ship in Deadfire. This is the object that serves to slow or stop a ship's movement. Typically, it's typically a large hook attached to the ship via line or chain. These are your bread and butter in combat. The canons in Pillars of Eternity 2: Deadfire one of three different types of ammo in combat and you can read up on the specifics in our Ship Combat, Naval Exploration, and Crew Management guide. The bow is the front of the ship and is crucial when trying to determine what way to turn (port or starboard). The aft is the back of the ship, also known as the stern. When facing the ship's bow, starboard is the right side of the ship. These are the goods that you carry on your ship. In Pillars of Eternity 2: Deadfire, this will include your crew's food, drink, additional components for the ship, and more. In Pillars of Eternity 2: Deadfire, jibing simply means you're flipping the direction of your ship. Wind isn't a concern, so your main concern is determining whether the port or seaboard side is pointed toward the enemy, or if you're fleeing or pursuing the enemy vessel. Jibing switches between these things during combat. This crew member is responsible for management of your ship's sails and equipment. The better the better boatswain, the more swiftly your ship and crew act. The helmsman is responsible for executing the captain's maneuvers and steers the ship across the sea. An experienced helmsman can get you where you need to go efficiently and safely. This crew member is responsible for keeping track of the ship's position in relation to land and to enemy ships. An experienced navigator will make more consistent movements in combat. These members will man the weapons aboard your ship. The better experienced they are, the more likely they hit their targets. When your crew members get hurt via combat or special events, the surgeon will have to get them healed up. The better he or she is, the faster your crew can return to their stations. The cook is responsible for keeping your crew happy with via whatever food and drink you, the captain, supply to the ship. Morale is key in Pillars of Eternity 2: Deadfire and you will be well served keeping spirits high on your vessel. These crew members are responsible for the maintenance of the hull and the safety of your cargo in Deadfire. Experienced deckhands will keep you in working condition and make sure that your spoils of war are kept in order. There's a whole lot more to digest in Obsidian's massive RPG, so be sure to bookmark our Pillars of Eternity 2: Deadfire walkthrough and guide hub to learn about everything from passive and active skills to classes, subclasses, and more.